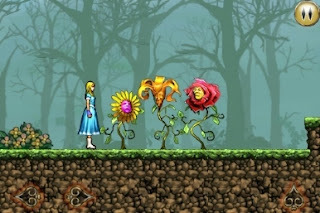 Home Games Alice in Wonderland in your iPhone! Now it is your wonderland! Alice in Wonderland in your iPhone! Now it is your wonderland! There is no argue that Alice in wonderland was everyone's favorite childhood fairy tale.Tim Burton's new film of the same name made people experience the same feelings that the story did in distant childhood. But it is not all! Here is the next surprise for you! Disney has released new Interactive iPhone game Alice in wonderland.You have opportunity to explore wonderland and experience Alice's hole adventure on your own any time you want just for $4.99. Don't miss the chance being hero of your childhood, what you 've dreamed about! The Cheshire Cat that makes objects appear or disappear; March Hare is moving objects; Mad Hatter transforms objects and White Rabbit--who can freeze the time. 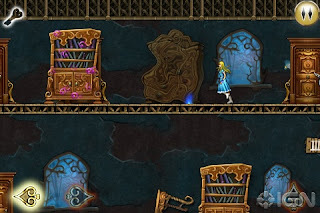 Alice in Wonderland -- An Adventure Beyond the Mirror is probably one of the best 2D platform puzzle games on the iPhone/iPod touch compatible with iPhone OS 2.2.1 or later.